Dr. John Carlin Roder, FRSC, passed away on Saturday, January 6, 2018. John was one of the Institute's first scientists, recruited by Lou Siminovitch in 1985 from Queens University. John spent over 30 years at LTRI as a Senior Scientist, before his retirement. For those who didn’t personally know John, he was an amazing scientist and truly caring person. Remarkably, in mid-career, he decided to switch his entire scientific focus from natural killer cells and immunology to the genetics of neuroscience. 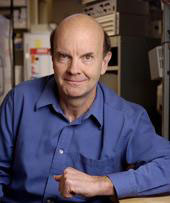 John went on to become a world leader in this field, developing new tests and mouse models of psychiatric disease including, as this Globe and Mail story describes, important advances in schizophrenia (https://www.theglobeandmail.com/life/a-clue-to-schizophrenias-elusive-cause/article20396778/). Dr. John C. Roder is a neurobiologist, and Senior Investigator at the Samuel Lunenfeld Research Institute of Mount Sinai Hospital. As a Professor in the Department of Molecular Genetics at the University of Toronto, Dr. Roder holds a Canada Research Chair (Tier 1) in Learning and Memory. Dr. Roder's ultimate goal is to discover new treatments for schizophrenia, anxiety, epilepsy, depression, and other mental disorders. His research focuses on the roles of molecules in the central nervous system and aims to determine targeted new drug therapies for neurological and psychiatric disease. He has carried out genome-wide forward and reverse genetic screens of ENU mutagenized mice. The Roder lab is also focused on identifying new genes, synapse and signaling pathways that contribute to learning and memory. In July of 2010, Dr. John Roder was elected into the Royal Society of Canada. In November he travelled with his wife to Ottawa to be officially inducted into the prestigeous organization. This award shows strong recognition by his peers for his excellence in learning and research. The Amalgamated Transit Union (ATU) has donated $51,000 to support neurobiology research conducted by Senior Investigator Dr. John Roder. The labour union has contributed annually to Dr. Roder’s research since 1994, through funds raised at their hockey tournament. To date, the ATU’s contributions have totaled approximately $500,000 and this year’s donation is the highest ever.